The first week of 2018 comes to an end and we have two important topics to discuss today. 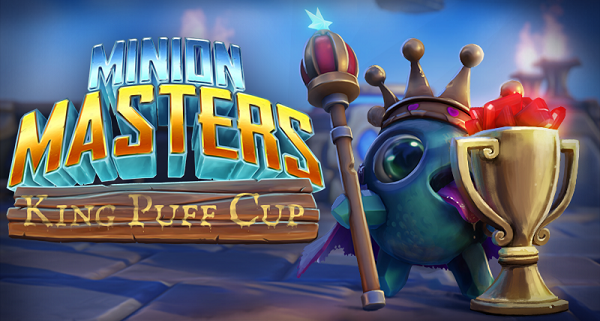 This weekend, competitive Minion Masters starts its 2018 journey and that means King Puff Cup returns with a $225 prize pool split amongst the Top4 participants. Additionally, the Expeditions rework has finally a set date to be released and we want to go over some details you definitely need to know prior to this update. Completing a challenge removes the encounter and rewards your with Might. Important note: You don't have to win the battle, but reach the objective. Progression is possible without winning. In addition to that overview, we will answer the most asked questions. What happens to our Supplies and Relics after the update? I loved the PvE aspect of Expeditions. Will this feature be gone? Like stated in the overview above, the new Expeditions will contain PvE fights, but the encounters are reduced. PvE fights are necessary to progress towards your rewards, though! The few encounters will test your might, which you gathered by completing the PvP challenges. After you have beaten the last boss, you can claim your rewards. Should I still run Expeditions or save my resources? With the implementation of the Spectator mode, the King Puff Cup staff decided to utilize this new feature for their first live broadcasting of a tournament. In the past, matches were broadcasted via replays, since spectating the matches was not possible. Spectator mode and live broadcasting is the next step to bring competitive Minion Masters closer to the viewers. OneCanOfSprite and Tengs will be your hosts on Saturday, January 6th at 14:00 UTC live on Twitch. The official announcement doesn't give us any hints how they plan to cast the matches and if that means more downtime between matches for the participants. If you have any questions on that subject, please feel free to contact FFA or Dipshit on Discord or write an email to kingpuffcup@gmail.com. By the way: you are still able to sign up for King Puff Cup 15 and participate for glory, honor and $225 in the prize pool! Remember that your participation grants you points depending on your performance within the tournaments. The 16 point leaders will be invited to the King Puff Cup Invitational in late February this year. That's all, Masters. Feel free to go back to the flying arenas and practice your skills or clear one or two of the current Expeditions!